Watch out - if you have an annoying ring tone, you could find yourself getting wet. 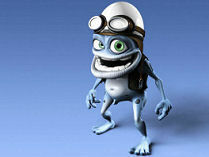 During this week, anybody heard playing the 'Crazy Frog' ring tone will be sprayed with water pistols, staff have vowed. Guests will be encouraged to identify any offenders to staff, so that they can douse them. The Marketing Manager for the park, Mike Lorimer, said: "The only frogs we want to have on park are our own spouting type which welcome guests in Towers Street. "We want our guests to go home screaming with pleasure. We don't want them to leave with screaming headaches because all they remember is the Crazy Frog song."